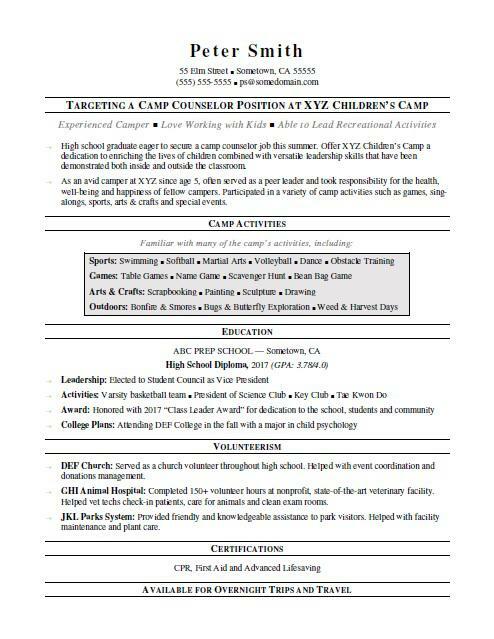 View this sample resume for a camp counselor, or download the camp counselor resume template in Word. Your skills amount to much more than just fun and games. To be considered for top camp counselor jobs, resume expert Kim Isaacs says it helps to have a comprehensive resume. For resume writing tips, view this sample resume for a camp counselor that Isaacs created below, or download the camp counselor resume template in Word. And if you need more help, get a free resume evaluation today from the experts at Monster's Resume Writing Service. Jobs for camp counselors and other recreation workers are projected to grow by 9% (or 34,000 jobs) from 2016 through 2026, according to the Bureau of Labor Statistics (BLS). You'll find the highest level of employment for this job in the following states: California, New York, ​Florida, Illinois, and Texas; and in the following metropolitan areas: New York City, Los Angeles, Chicago, Washington D.C., and Minneapolis. As a waitress, you can expect to earn a median wage of $24,540 per year, or $11.80 per hour, according to the BLS. Additionally, you can search for camp counselor jobs on Monster. High school graduate eager to secure a camp counselor job this summer. Offer XYZ Children’s Camp a dedication to enriching the lives of children combined with versatile leadership skills that have been demonstrated both inside and outside the classroom. As an avid camper at XYZ since age 5, often served as a peer leader and took responsibility for the health, well-being and happiness of fellow campers. Participated in a variety of camp activities such as games, sing-alongs, sports, arts & crafts and special events. DEF Church: Served as a church volunteer throughout high school. Helped with event coordination and donations management. GHI Animal Hospital: Completed 150+ volunteer hours at nonprofit, state-of-the-art veterinary Helped vet techs check-in patients, care for animals and clean exam rooms. JKL Parks System: Provided friendly and knowledgeable assistance to park visitors. Helped with facility maintenance and plant care.